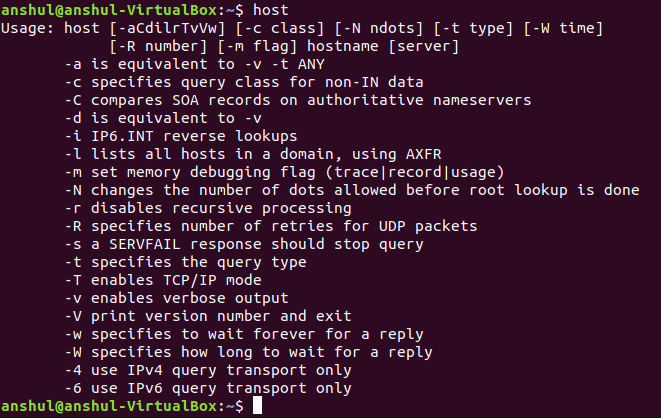 host command in Linux system is used for DNS (Domain Name System) lookup operations. In simple words, this command is used to find the IP address of a particular domain name or if you want to find out the domain name of a particular IP address the host command becomes handy. You can also find more specific details of a domain by specifying the corresponding option along with the domain name. host command without any option: It will print the general syntax of the command along with the various options that can be used with the host command as well as gives a brief description about each option. host domain_name: This will print the IP address details of the specified domain. host IP_Address: This will display the domain details of the specified IP Address. -a or -v: It used to specify the query type or enables the verbose output. -t : It is used to specify the type of query. -C : In order to compare the SOA records on authoritative nameservers. -R : In order to specify the number of retries you can do in case one try fails. If anyone try succeeds then the command stops. -l :In order to list all hosts in a domain.For this command to work you need to be either an admin or a node server.